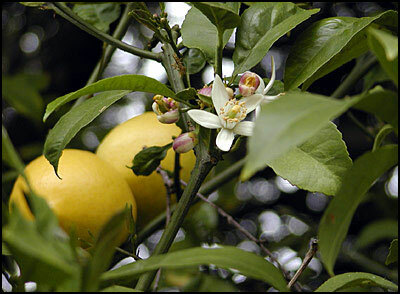 Meyer Lemon is a very popular citrus for homeowners to grow. It is also a favorite of chefs and gourmets It is slightly sweeter than the classic commercial varieties such as <?xml:namespace prefix = st1 ns = "urn:schemas-microsoft-com:office:smarttags" />Eureka and Lisbon. Its soft skin develops a slight orange cast when fruit is fully ripe, its distinctive flavor combines lemon with a hint of tangerine. It is easy to grow, compact, and prolific in its blooming and fruiting. 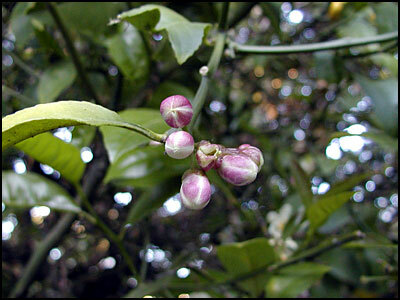 The tree often flowers twice a year, so both fruit and flowers can be present all year long. It does not need a lot of heat to ripen the fruit. 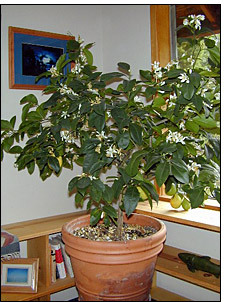 Meyer lemon trees are around 6 to 10 feet (2–3 meters) tall at maturity, though can be kept pruned smaller. Mature leaves are dark green and shiny, young leaves and shoots are dark purple. Flowers are white with a purple base and fragrant. Fruit is yellow and rounder than a true lemon with a slight orange tint when ripe. It has a sweeter, less acidic flavor than the more common lemon (Lisbon or Eureka are typical grocery store varieties) and a fragrant edible skin. 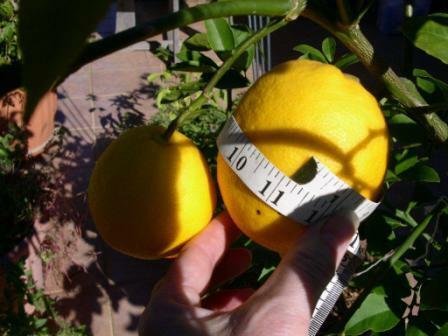 Meyer lemons are fairly vigorous and reasonably hardy, but grow best in a warm climate. Trees usually begin fruiting in four years. Most fruit is produced from December to April, but fruit can be produced in any season. Trees require adequate water, but less in the winter. For maximum yield, they should be fertilized during growing periods with organic fertilizers. Meyer lemons are popular as ornamental plants due to their compact size, hardiness and productivity. They are highly decorative and are suitable for container growing. By the mid 1940s the Meyer lemon had become widely grown in California. However, at that time it was discovered that a majority of the Meyer lemon trees being cloned were symptomless carriers of the Citrus tristeza virus, a virus which has killed and damaged millions of citrus trees all over the world. 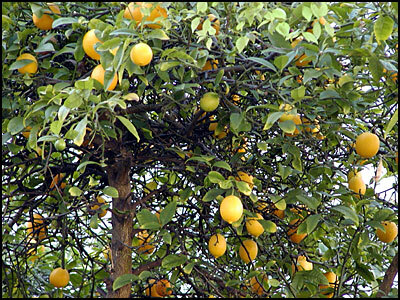 After this finding, most of the Meyer lemon trees in the United States were destroyed to save other citrus trees. A virus-free selection was found in the 1950s by the California company Four Winds Growers, and was later certified and released by the University of California in 1975. 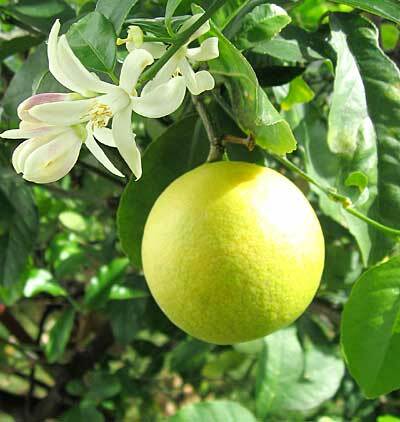 To help distinguish it, this release is known by the name Improved Meyer lemon. 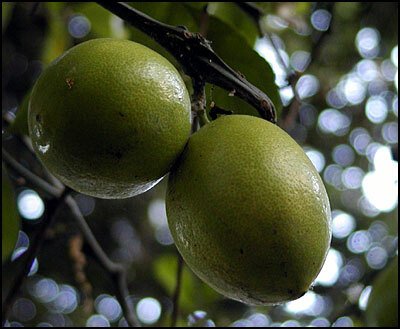 The Meyer lemon is named after Frank N. Meyer, a.k.a. 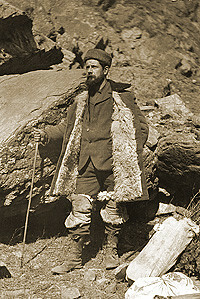 Frans Nicholas Meijer (1875-1918), a USDA employee who discovered it in China. Frank N. Meyer on the trail of the elusive Meyer lemon. Photo from USDA. I have several lemon trees in pots. This is my second year to grow lemons. I enclose a photo of one of my lemons which is an 'over achiever'. It is till growing but as of December 1 it is just over 10.5 inches around the middle. I haven't measure around end to end yet but it will be larger that direction. The increased size may be because it is attached directly to a branch.